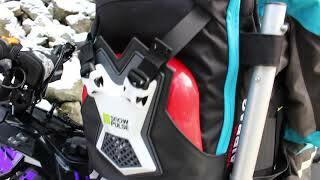 The Highmark CHARGER RAS Avalanche Airbag with Snowpulse 3.0 Inflation Technology is the newest and most advanced avalanche airbag vest for snowmobilers. By eliminating the front zipper and embracing a heavy-duty wrap-around belt underneath the vest, fit and comfort is paramount with this vest. The Vest features a standard Highmark pack on it. This one is 16L and has pouches for a communication device and avy gear, first aid kit, etc. The front has a pouch for the transceiver and zippered pocket for other need-to-get-at items. The Highmark Spire Vest is the avalanche airbag for snowmobilers who demand the ultimate in protection and supreme comfort. The Highmark Spire comes with a Protection Airbag System and the unique comfort and fit of a vest. The SPIRE is unlike any other Vest on the market. It’s made of a super lightweight material that reduces weight, increases mobility and makes for a much cooler experience – temperature wise and otherwise! Featuring the Snowpulse 2.0 system (the lightest avalanche airbag system on the market) and a Protection Airbag System (P.A.S. ), the Highmark Pro delivers more protection from trauma incurred during an avalanche than any other airbag. The unique horseshoe-shaped airbag deploys around the head, neck, and chest to offer key protection to these areas. Like all Highmark available airbags, you’ll find lots of snowmobile-specific features on these packs, including exterior shovel storage and a right-side (left hand!) trigger pull so that you can keep your finger on the throttle when speed matters. Designed in Canada by snowmobilers and built by Mammut. Gearing up is easy with BCA Float MtnPro Vest – an all-in-one, lightweight protective vest with avalanche airbag for snowmobilers. This avalanche airbag features integration for BC Link radios, hydration compatibility, left or right side trigger mount, fixed leg strap, zippered front pockets, adjustable waist belt and side panels and tether loop for attaching snowmobile kill switch. The Backcountry Access Mountain Pro Vest Avalanche Airbag is designed for high-performance mountain sledding. The Float MtnPro vest avalanche airbag is a low profile pack/vest combo that easily integrates with external equipment (such as hydration systems or our BC link radios). Full front, side and back protection with 1mm of hard shell sandwiched between two layers of PE foam provide protection from trees, rocks, handlebars, or whatever else you might come across on your adventures. The Float MtnPro Vest includes external shovel carry, secure dual side-release buckles over the front zip, articulated shoulders, and bigger pockets. Looking for a Refill Center? To complete the pack, please add a compressed air cylinder below. The Snowpulse cylinder is made from aluminium and should be filled with dry compressed air to 3000psi. The cylinder has a pressure gauge so you can see how full it is, or check for the unlikely event that it has leaked. You should always check the pressure gauge before you head out. The extra cylinder is great to have as a back-up on a long trip – in case you accidentally deploy your pack and you are nowhere near a refilling station. Used for all Mammut and Highmark by Snowpulse packs.